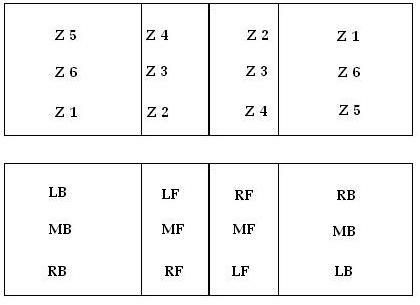 Volleyball positions on a team consist of 3 front row players and 3 back row players. Players in the front row are attackers, blockers, and maybe a setter. Players in the back row are passers, diggers and also maybe a player setting. On a sideout, the players on the team that won the rally rotate positions clockwise around the court. Advanced volleyball teams may run an offense where the same setter sets in every rotation. Also, advanced teams may have back row players attack from the backcourt. The setter is the player on the volleyball team that sets the teams attackers. A setter position is similar to a quarterback in football or a point guard in basketball in the sense that the setter runs the teams offense. Some teams may choose to have multiple setters run the team offense. Teams outside hitters are usually the primary attackers on the team. These hitters attack balls that are set to the left side of the court. Outside hitters may also be referred to as outside blockers. Teams weak side hitters hit from the right side of the court and are usually not the primary attackers on the team. Weakside hitters may also be referred to as weakside blockers. Teams middle hitters hit balls set at the net in the middle of the court. Middle hitters are sometimes the primary attackers on the team. Middle hitters are commonly used as a decoy to freeze or confuse the opposing teams blockers. 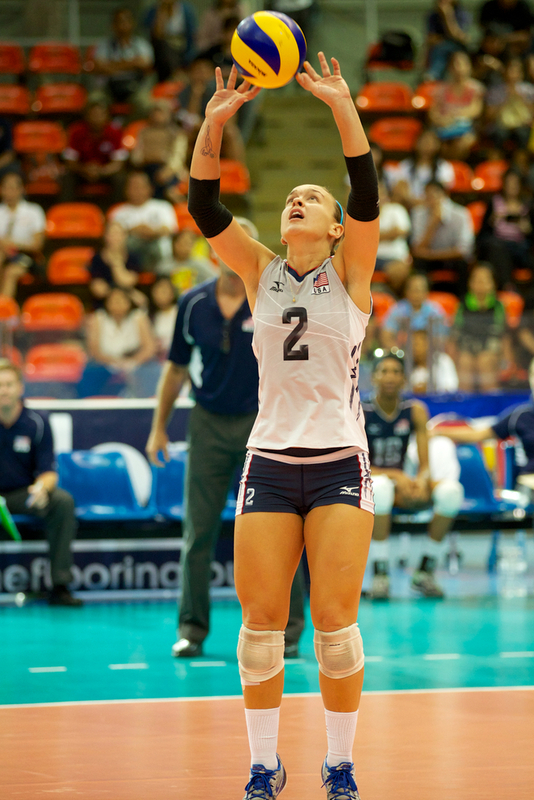 A middle hitter is also referred to as a middle blocker or just middle. Middle blockers are often in charge of front row players to coordinate team blocking strategy. The libero plays a special roll in team defense and passing. The libero is the player on the volleyball team that can come into the game and replace any player on the back row. The libero is sometimes called a defensive specialist or DS. The libero may be put in the game to pass for a weaker passer or to help cover the court by making great defensive plays. The libero may also serve in one rotation. The player that is right back is in the rotation position in the backcourt on right side of the court. At the start of the rally, this is the player that starts in Zone 1. When a team rotates, it's the player rotating to the right back position that goes back to serve. The player that is right front is in the rotation position at the net on right side of the court. At the start of the rally, this is the player that starts in Zone 2. The player that is middle front is in the rotation position at the net in the center. At the start of the rally, this is the player that starts in Zone 3. The player that is left front is in the rotation position at the net on left side of the court. At the start of the rally, this is the player that starts in Zone 4. The player that is left back is in the rotation position in the backcourt on the left side of the court. At the start of the rally, this is the player that starts in Zone 5. The player that is middle back is in the rotation position in the backcourt in the middle. At the start of the rally, this is the player that starts in Zone 6.